My experience was a bit unique in that my mother worked her entire career at a local state university. One of the amazing benefits of doing so was the free tuition afforded to her immediate family members. That’s right, if I went to university at her workplace, I went tuition FREE. No brainer! Now, this was an incredible opportunity that has made a tremendous difference in my life. But did I fully capitalize on it? Sadly, no. 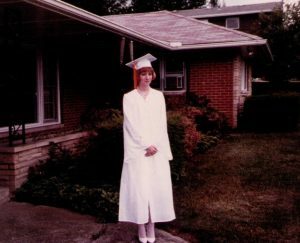 From looking somewhat sad and terrified on high school graduation day…. Socially immature, I likely could have benefited from either taking a year off before college or spending my freshman year living at home and commuting to class. My parents were both hard-working and disciplined but my friends at school liked to shop, tan (hey…it was the 80’s) and go out. This siren call proved to be too much and I didn’t take my studies (or life in general) as seriously as I should have. Fortunately by mid-sophomore year I got my act together and improved my academic performance. 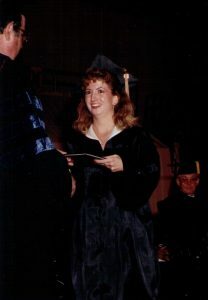 …to much happier and more confident at college graduation! The potential ROI of a major is much more important today than when I was in school. Inflation-adjusted tuition is much higher and kids are leaving school with much more debt. 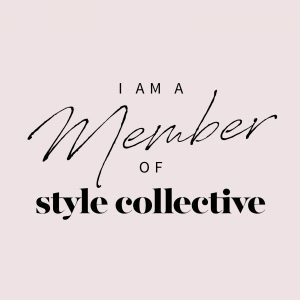 Initially my hope was to pursue fashion merchandising as a career. The school I attended was one of the top in that industry at the time. 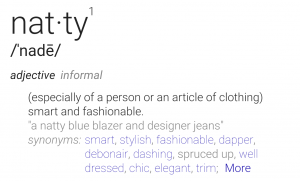 Fortunately some family and friends realized that the reality of getting a great paying job in fashion merchandising in Cleveland, Ohio was a bit of long shot and suggested I switch to marketing/business management as a more flexible degree. Sure, I could still pursue a retail job upon graduation but a lot of other avenues would also be open to me and I learned about how to manage my personal finances via these classes as well. More recently, we had a discussion with my niece who was set on pursuing a medical degree in anesthesiology. Through a family friend we learned that as a nurse anesthetist, she could earn 50-75% of an anesthesiologist’s salary, be entitled to the same attractive hours and working conditions but with years less schooling and, ultimately, less debt. 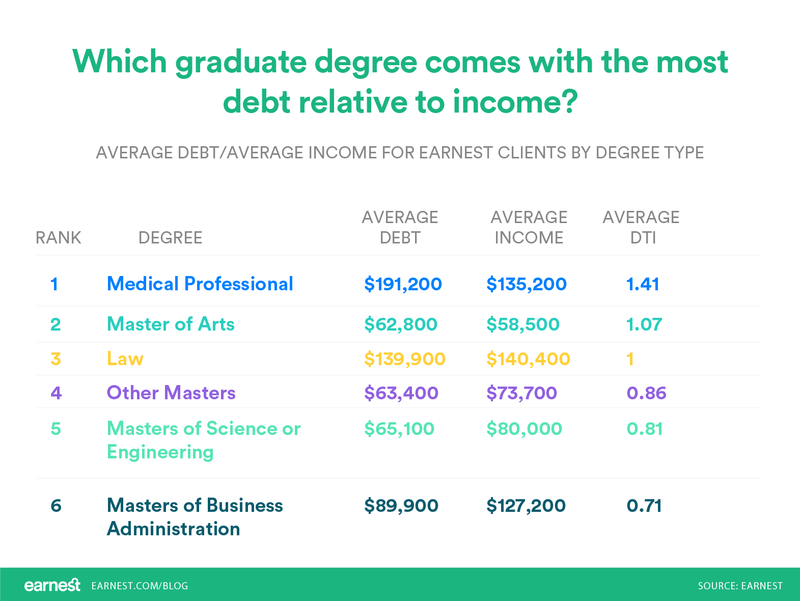 While I don’t want to deny anyone their life’s passion, it’s smart to realize that all things being equal, the debt ratio of an engineering degree is bound to be much lower than that of a social sciences degree. Community Colleges – They can be a great way to rack up two years worth of credit at a lower cost. Some schools even enable students to earn college credit FOR FREE while still in high school. Imagine graduating high school with a year or two of college courses already under your belt! Exhaust your potential scholarship search. BigFuture and Scholly have comprehensive initial search lists. Loan Shopping – Even a small change in percentage rate can make a HUGE difference in the total amount you will owe on a loan so shop around! If you’ve already graduated, consider a refinancing option like those through Earnest. UPDATE AUGUST 9, 2018: LendEDU recently ranked Earnest #1 in the top 5 of student loan refinance lenders for Q3, 2018. Read the article here. LendEDU is an online marketplace for financial products. It has been compared to Lendingtree.com, but for student lending. Use your spending money wisely. Don’t let food cards go to waste. If you under-utilize your food plan, switch to a lesser plan or see if you can sell your unused portion to another student. While it’s important to occasionally blow off a little steam, all the junk food, silly impulse purchases and nights out that I spent money on didn’t amount to much at the end of the day. As you prepare to leave undergraduate school, familiarize yourself with what it costs to live in the town you hope to base yourself in. Again, if you are considering graduate school, investigate the potential ROI. This Earnest article has extremely useful information. While I certainly grew into myself a bit while at school, looking back I wish I would have taken even greater advantage of the opportunities presented. Internships. Study abroad programs. Interesting part-time jobs. Etc. Naturally a bit self-conscious, I’ve always hesitated to put myself out there when it comes to potential failure or ridicule. 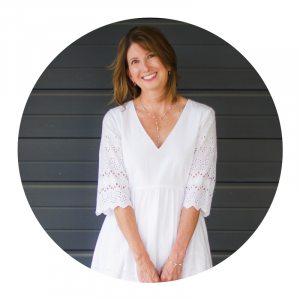 To help get over that I started asking myself the question “What will make for a more interesting life story?” This simple question has helped take the fear out of pursuing new opportunities and has let me focus on building an incredibly interesting and satisfying life! The rewards have been tremendous. NOW is YOUR time to seize these opportunities! Never again will it be as easy to sample and try so much. So go get ’em. I believe in you and your future! I love this post. It seems like today kids coming out of college, even with advance degrees, and tons of debt…BUT…they can’t get a job to support that debt. Yes, the ever-escalating costs must be somewhat discouraging for both the kids and their parents! I’m hoping my son learns some fiscal responsibility but I think it’s going to take awhile. He has just joined a fraternity which I think will help him in meeting new people and network later for his career. He is my social butterfly and college has just helped him blossom even more. Such a fun time in life! So glad he’s enjoying the college experience!